Happy 2012, everyone! 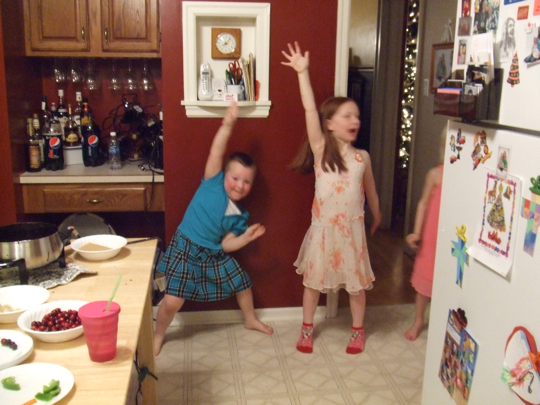 I hope your New Year’s Eve was as happy as Tim and Tara’s. The Pesters had a bunch of people over and the children ran around – all dressed in finery from the dress-up collection – and as we commented on Tim’s lovely dress, someone said that he was the lone boy in the group. Tim pointed up and responded vehemently, “Nuh-uh! There’s God and Jesus.” Ok. Point taken. Brad has left, and I realized that since he comes every six months, my life is being chopped up into half-years. So, instead of making fake New Year’s Resolutions, I’m going to come up with some fake Half Year Resolutions. We’ll check back in July to see if I’ve done any of them. FHYR #1 – Follow directions better. Remember when I slept so soundly on Wednesday, when I wasn’t butchering a squash? Well, I took one dose of nighttime medicine in the morning and one in the afternoon. 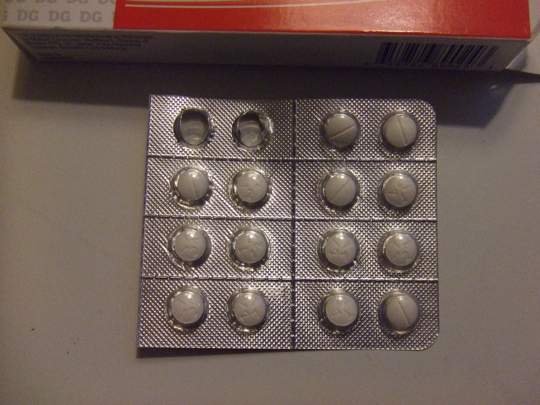 Look at this and tell me what you would guess a dose is? 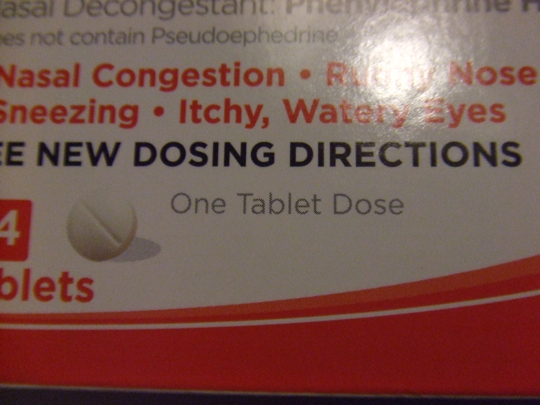 Two tablets, huh? Guess again, Smarty McSmarterson. No wonder I was comatose. FHYR #2 – Do more than just scan the headlines at CNN.com. About a year or so ago I was incredibly ashamed at how little I knew about the goings-on of our world, so I bookmarked CNN and started to just look over the front page once a day. That tiny step has helped, but just a little. My poor little brain needs baby steps to grow, so I’ll just push it a little bit. I’ll try to change that. That’s enough for now. I can’t wait until tomorrow when I’ll have completely forgotten these promises I’ve made! Interesting idea… Maybe the resolutions will seem easier if they’re for a shorter term. I would say something about exercising more, but who’s kidding who? I’m not going to do that. Maybe I should resolve to finally cancel my Bally’s membership. Bally’s is still in business? I had thought it went belly up years ago. Maybe that was just my local gym, and I had cancelled my membership when I moved back in 2004. Maybe I should be reading the news more faithfully also. Pastor Oldsen told me that he told his dad once that a pessimist is more optimistic than than an optimist, because he’ll never be disappointed. Happy New Year to you both too! Instead of Half Year Resolutions, I’m doing Half-Assed Resolutions. I shall endeavour to drink an undisclosed amount less, be somewhat more creative and have more fun. With such vagueness, I can’t fail! I resolve to watch more TV & eat more chocolate. Wait, we’re talking about possilbe resolutions. I am so disciplined in some areas….like at work, but horrible with other stuff. Why is that? Do I use up all my discipline from 8am-4pm, M-F? I resolve to discover the secret of all those disciplined people who exercise regularly. Any of you disciplined out there, please help! If you are looking for a New Year movie marathon, Downton Abbey is an Emmy winning Masterpiece Theater series that debuted last year. Set in England leading up to WWI, it is a story about a wealthy family and their household staff. Very entertaining. There are just 7 or so episodes you can catch up on at NetFlix and the new season premiers tonight on PBS. Happy New Year! At least you got some sleep That helped a lot I am sure. I’m going to throw out one piece of trash every day. Well, at least for the month of January.